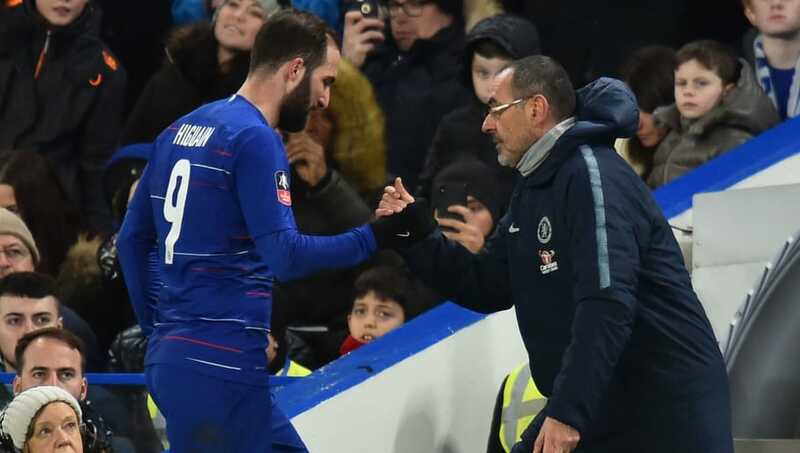 ​Chelsea boss Maurizio Sarri has insisted that his ‘footballing son’ Gonzalo Higuain is the ideal focal point for Sarriball take effect at Stamford Bridge. The Argentine striker was reunited with his former Napoli boss when he arrived on loan from Juventus in January and has quickly made his mark in the Premier League, scoring a brace during the Blues’ 5-0 thrashing of Huddersfield last weekend. ​Higuain previously matched a Serie A record by scoring 36 goals in a season under Sarri at ​Napoli, with many hoping the striker can be the end to Chelsea's problem position. When asked about Higuain’s claim that Sarri is a father figure, the Chelsea boss replied, via the Daily Mail,: “I hope I am the football father! “I don’t know the mother of Gonzalo. He reacts very well to difficulties. He needs confidence and a good relationship with the coach. Whilst Higuain appears to be thriving in the early phases of his ​Chelsea career, growing concerns surround the future of Hazard at Stamford Bridge amid persistent rumours linking the Belgian with ​Real Madrid. Chelsea will look to maintain the momentum from their emphatic win last weekend as Sarri’s side travel to face champions ​Manchester City in a huge game in both the races for the Premier League title and for the top four.